Free Shipping Included! Womens Cuff Bracelet, w/ Pave Circle of Swarovski Crystals and Man on Horse - Ladies Jewelry (Gunmetal Toned) by Be-Je Designs at SCRHI. Hurry! Limited time offer. Offer valid only while supplies last. Womens modern cuff bracelet. 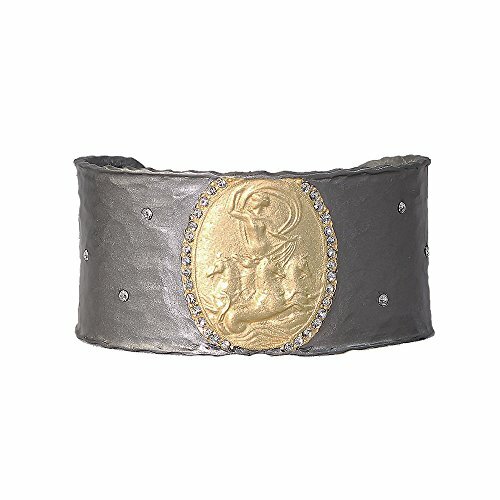 This beautiful modern ladies bracelet is gunmetal -toned and features a pave circle of clear Swarovski crystals, with a gold-toned, hammered out illustration of a man riding a horse. Dimensions: This trendy ladies cuff bracelet is approximately 3"x2". Weight 26 grams. Features: Modern bracelet is gunmetal-toned features an elaborate circular pattern of clear Swarovski crystals surrounding a gold-toned, hammered out model of a man riding a horse. Lightweight, stylish and comfortable accessory. Design & Style: Made with 100% real Swarovski crystals - not glass! Cuff bracelet jewelry is C-Shaped and is designed to be wider than a standard bracelet. Cuff bracelet fits more closely and tighter on the wrist than a bangle and is generally open on both ends. Suitable For: This bracelet is great for all sorts of events, dinners, and parties. Bracelet is very versatile and fashionable and can be worn with casual and formal events. Goes great with many outfit combinations from dressy to casual. This jewelry is a great gift for women, ladies, girls, the love of your life, girlfriends, brides, coworkers, moms, grandmas and grandkids. Great for engagements, weddings, birthdays, anniversaries, holidays and Christmas. If you have any questions about this product by Be-Je Designs, contact us by completing and submitting the form below. If you are looking for a specif part number, please include it with your message.